"Dr. Will Cole brings his years of clinical experience to the table with this great new book. Ketogenic diets are often considered meat based, but there are many plant based options as well. This book brings a fantastic, fresh perspective to light." 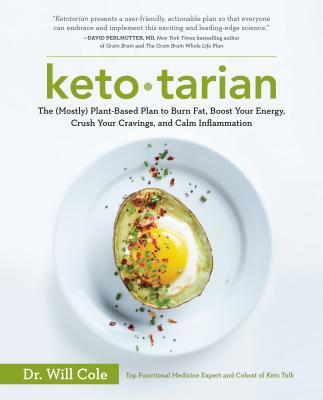 "The science developing around Keto is exciting, so having someone as knowledgeable as Will write Ketotarian is essential for embracing keto in a plant-based way." "It is always one genius or another who creates new ways of combining ideas to make them even more powerful, and therefore more helpful. This time Dr. Will Cole has done it with Ketotarian, which I predict will power a movement. I am jealous that I didn’t think of it first, but so happy that such a brilliant mind, and more importantly, such a great doctor has done it and now will be available to everyone’s benefit." "For years, I struggled to find a way to feel balanced and healthy. Dr. Will Cole played a huge role in helping me find a way to re-boot my system and make me feel strong again, whether at home or on the road. Now, I’m back to feeling empowered and in control of my body, and I know that is in part because of the way Dr. Cole guided me down the path toward daily optimal health." "Having been a vegan or vegaquarian for more than 23 years, I understand the true challenges of conscious eating and practical life. Ketotarian offers a simple healthful approach, grounded in credible science, to help you thrive and achieve optimal wellness. I'm hugely grateful that Dr. Will Cole is leading this paradigm shift for humanity and the planet." "Dr. Cole's new book is highly informative, yet easy to understand when it comes to what we should be eating and how to combat issues you might be facing. It's very important for my clients to know the 'why' behind how certain foods can affect them, and I believe this book gives great insight into solving some of those unanswered questions."